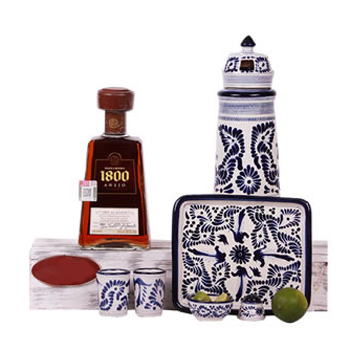 Gift the boss something unique and collectible with the 1800 Tequila Time Gift Set. Made from Blue Agave and finished with notes of Toasted Oak, Vanilla, and Butterscotch, 1800 Tequila Anejo is flavored just right for the holiday season. Enjoy it with the exquisite Talavera Set. Included you will find a Decanter (25 cm), Tray (20x17 cm), 2 Shot Glasses, and 1 Mini Bowl.